Axle shock absorbers are of great importance for driving safety. They serve to suppress the vibration of the unsprung mass of the vehicle. The impact of shocks which are transmitted to the vehicle by uneven road surfaces is dampened by the shock absorbers. When deciding on the parameters for the level of damping, the best possible compromise is looked for between comfort (low damping force) and driving safety (high damping force). The operating piston with the piston rod moves within an oil-filled tube. During the axial movement of the piston rod, the oil is forced through narrow channels and valves through the pistons. With the speed of the piston motion, the flow resistance and thus the damping effect increases. 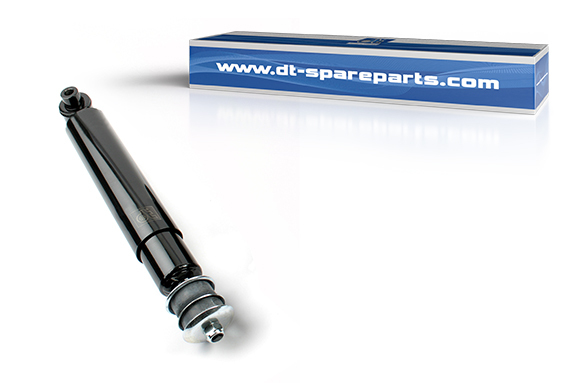 DT® Spare Parts shock absorbers are designed for a service life of 10 million cycles. Corrosion resistance is tested in a salt spray test for 500 hours. The function of the shock absorber is guaranteed even at extreme temperatures of between –40 °C and + 70 °C. The reinforced sheet metal casing tubes have a thickness of 2.5 mm. This prevents premature corrosion. The piston rod has a thickness of 22 mm and is furnished with a chrome plating of at least 25 μ. The high-quality, multi-lip piston rod seal adjusts itself to normal wear and tear. Besides shock absorbers for axles, the extensive DT® Spare Parts product range offers shock absorbers for cabin, as well as gas springs.